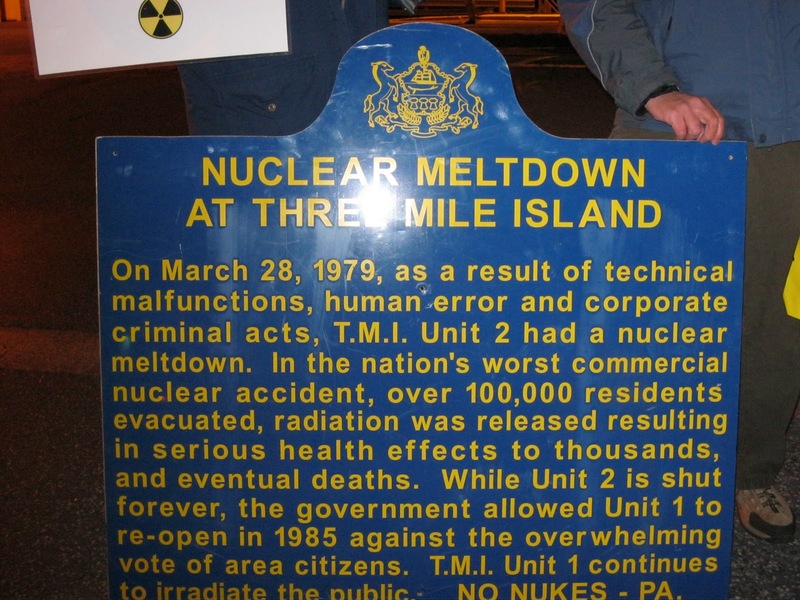 ﻿ ﻿Today marks the 32nd anniversary of the Three Mile Island disaster in Middletown, PA. On this date in 1979, a partial nuclear core meltdown occurred in TMI's Unit 2 reactor, resulting in the greatest nuclear plant disaster in U.S. history. 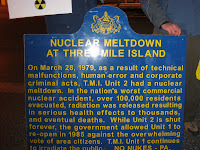 Others around the world are marking the TMI disaster alongside Fukushima crisis as well. South Korean environmental activists also staged a rally today to mark the 32nd anniversary of the TMI disaster. Speaking events comparing TMI and Fukushima are scheduled for tonight as well. What motivates these anti-nuclear is the belief that societies can learn from past mistakes and prevent future nuclear catastrophes. In other words, a belief in human responsibility lies at the core of these efforts. People would not speak out against the potential dangers of nuclear power unless they believed that society could move away from nuclear power and toward safer, renewable sources of energy. Good decisions by leaders, energy industry professionals, and citizens can prevent future disasters and cultivate a safer world. Thus, it disappoints me when some fundamentalists blame Japan's catastrophes on God's wrath over alleged impious behavior, divine withdrawal of protection, or associate them with demonic influences (as this YouTube video does, assuming it is not a Poe). When we blame problems on supernatural causes, we erase our own responsibility to prevent those problems through concrete measures. The Fukushima crisis will not be solved through superstition, but through the dedication, sacrifice, and ingenuity of everyone working on the crisis. Future nuclear crises will not be prevented through superstition, but through practical human efforts. On the 32nd anniversary of TMI, as the crisis in Fukushima rages, let's honor those who are working diligently to bring the disaster under control. Let's also honor those who are striving for a safer future beyond nuclear power. Blaming things on God's wrath is a fearful, ridiculous, childish reaction (wait, that insults the intelligence of children, who would know better than to be so foolish!) Drives me nuts. I think it would help if we also worked harder to waste less energy, so that we would require less energy, but sometimes it seems to me that people just don't give a damn. It's disheartening. And those workers who are risking their lives to contain the nuclear disaster in Japan are amazing. Many of them will die as a result of their efforts. I could not be so brave! What motivates these anti-nuclear is the belief that societies can learn from past mistakes and prevent future nuclear catastrophes. They can. For example, on Sunday there was an election in one of the most conservative states in Germany, and the conservative party which had run the state for almost 60 years was voted out in favor of a coalition of "Greens" (environmentalist party with an anti-nuclear-power platform) and social democrats, with the Greens as the senior partner. I have a post about it here. And those workers who are risking their lives to contain the nuclear disaster in Japan are amazing. Many of them will die as a result of their efforts. The same happened in the USSR after the Chernobyl meltdown. Many firemen, and pilots who flew in low to dump loads of sand on the reactor, knowingly took lethal doses of radiation. They gave their lives for their country just as soldiers in wartime do. As it was, the results were bad enough. A vast rural area north of the plant was contaminated. I've seen photos of animals born on farms there afterwards -- pigs with no eyes, a horse with eight legs, and so on. The Soviet government advised people in the area to not have children -- that was all they could do. Let's hope Fukushima galvanizes Americans to take action, before something like that happens here -- whether because of an earthquake or terrorists targeting a reactor. You know, Ahab, I'm convinced there is another aspect to this that is more sinister: Greed. There is a lot of money to be made in nuclear energy. The development of cleaner, safer, and much much cheaper sources of energy will directly and adversely impact certain wealthy industrialists. You can bet they do not want that to happen. I also believe the greedy often exploit the maddening ignorance and gullibility of religious fundamentalists to further their own economic interests. I tell ya, if we don't kill our own species off with greed and ignorance it will be a miracle. Knatolee -- I too am humbled by the courage of those working within the Fukushima facility. Crises require rational, level-headed responses, as well as forethought to prevent future crises. Superstition doesn't fall into this category, and that's why it irritates me. Infidel753: I hope that Fukushima galvanizes Americans to speak up. We need to phase out nuclear power to protect the environment and public safety. Have you seen the Kid of Speed site? It's a poigniant photo journal of the Chernobyl "dead zone."